Born the 28th of December 1895 in Tôkyô in the district of Zôshigaya. He made his debut on stage (hatsubutai) in May 1902 at the Suehiroza and at the Ichimuraza. He became disciple of Morita Kan'ya XIII in May 1910. He passed the nadai exam in May 1923 and received the name of Bandô Shinasaku in November 1924 to celebrate this success. He took the name of Kataoka Gayû II in May 1940. He was most likely a disciple of Kataoka Gatô IV. He appeared on stage for the last time in September 1962, in Tôkyô at the Tôyoko Hall, where he performed in "Meoto Kago". He died the 31st of May 1963. He was a supporting tachiyaku actor, who excelled in henchman roles in kyôkakumono or matatabimono. His two most notable roles were Kashiyama Kiichirô ("Ippon Gatana Dohyô Iri") and Odedeko Denji ("Omatsuri Sashichi"). Once, he played the role of the boatman in "Nozaki-mura". At the end of the play, the boat carrying Osome and her mother was pulled with rope on the hanamichi. Gayû fell from the hanamichi on some customer seats. He climbed back on the hanamichi and crawled up hastily after the boat like a swimmer trying desperately to reach his drifting boat. Born in Asakusa the 22nd of December 1908. Son of the actor Nakamura Tomiemon, he started his career as a disciple of Kataoka Ichizô IV, who gave him the name of Kataoka Hanzô III. He made his debut on stage (hatsubutai) in May 1918 at the Kabukiza. He passed the nadai exam in October 1932. He performed in the troupe led by Ichikawa Ennosuke II from the middle of the 1920s to the 1930s. He also performed in several non-Kabuki troupes or worked as a movie actor (11 movies between 1959 and 1968). He also worked for the television. His last-recorded performance in Kabuki happened in June 1973, in Tôkyô at the Kabukiza, where he played the roles of Kobishiya and the retainer Jinnai in "Edo no Yûdachi" and "Yoritomo no Shi". 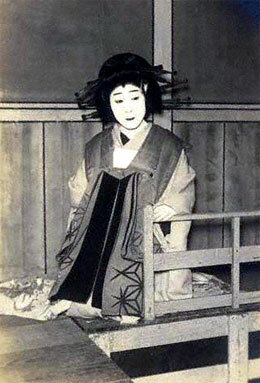 There were records of non-Kabuki performances up to 1982. No record afterwards (is he still alive?). He was a sanmaime supporting actor. His best roles were a guard in "Kanjinchô", Sangorô in "Shigure no Kotatsu", the priest Kokuunbô (the "black cloud bonze") in "Narukami" or Kadoebi Tôsuke in "Bunshichi Mottoi". Born the 6th of February 1927. He started his acting career in 1942 as a member of the Zenshinza troupe. His first stage name was Yamamura Takejirô. He made his debut on stage (hatsubutai) in September 1942 at the Minamiza. He became disciple of Kataoka Ichizô V in January 1947 and received the name of Kataoka Ichimatsu. He was, since the passing away of Ichimura Tsuruzô (1924~2015) the 26th of December 2015, the oldest Kabuki actor. He appeared on stage for the last time in February 2016, in Tôkyô at the Kabukiza, where he performed in the drama "Shinsho Taikôki". He was a supporting actor who never passed the nadai exam but faithfully served both Kataoka Ichizô V and Kataoka Ichizô VI for almost 74 years. He died the 20th of May 2016. Born the 28th of May 1896. Younger brother of the playwright Seto Eiichi and elder brother of the Shinpa actor Seto Hideo. He became disciple of Nakamura Matagorô I in 1916 and received the name of Nakamura Shijaku I. His master died the 19th of March 1920. The following year, he joined the troupe of Nakamura Kichiemon I and received the name of Nakamura Kichinosuke I in June 1921 at the Shintomiza. He went to Ôsaka a few years later and took the name of Kataoka Matsutarô at the Yachiyoza in Matsushima (Ôsaka) in November 1925. He performed in Tôkyô koshibai at the beginning of the 1930s but no record afterwards. Day of death unknown.